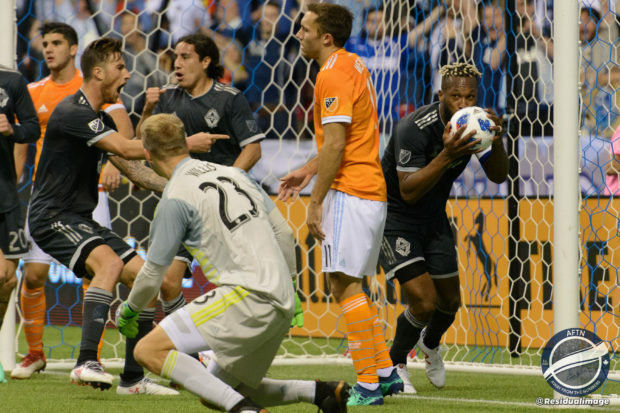 In what seemed like a wild rollercoaster ride in the final minutes, Vancouver Whitecaps were able to come from behind for the second time in the match to earn a share of the points with Houston Dynamo. The go ahead goals by the visitors came from Tomas Martinez and Mauro Manotas while Vancouver tied the score thanks to tallies by center half duo Jose Aja and Kendall Waston, with both goals coming at the death of each half. The Whitecaps started strong with Kei Kamara, who was making his first start in over a month, heading a Bernie Ibini cross over the bar in the third minute. They would continue to get opportunities to open the scoring but were unable to get that finished product past Joe Willis. That was to be a story of their night. Houston made the ‘Caps pay for missing their chances in the 35th minute when Tomas Martinez finished off a Albert Elis pass at the top of the box, firing a low one past Brian Rowe, who was in the Vancouver goal following a knee injury to Stefan Marinovic at Whitecaps training on Thursday. It looked as though the Dynamo would go into the break with the lead until Aja picked up his first as a Whitecap, and his MLS career, flicking a Waston pass from in close and at a tight angle. It was a great finish from the centre back, showing the attacking players how things should be done. Just after the hour mark Ibini sent in a strike from outside the box that forced Willis to go low and palm the ball around the post into touch. With 20 minutes to go the ‘Caps Captain had his chance to put Vancouver ahead but his header into what looked like an open net was knocked away by the Dynamo keeper with a sprawling last ditch save on the goalline. The final ten minutes saw a plethora of chances by the home side that should have put the club up on each one, but a combination of poor finishing, strong goalkeeping, bad bounces, and the woodwork somehow kept the visitors lead intact. In those final minutes the best chance came from Brek Shea who, while all alone inside the six yard area. flubbed his attempt with the goal gaping. 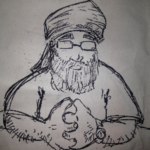 If that was the story of the night, you had always had this feeling that Houston may be on the ropes but they had a suckerpunch just waiting to be delivered. And they did. It looked as though all was lost for the home side in the 90th minute as the Dynamo went ahead as Manotas collected a blocked shot and buried the ball behind a helpless Rowe, sparking jubilant scenes on the Houston bench. The visitors had simply not been in the half, but now stood just stoppage time from a first ever win in Vancouver. 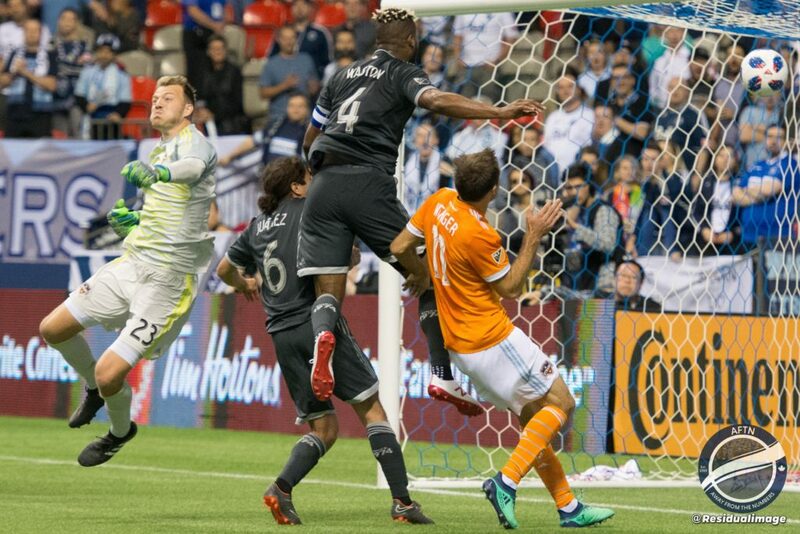 Fortunately for the Whitecaps, and the people remaining in the stands, Waston came to rescue at the death as he climbed to knock on a headed pass from Kamara to salvage the point. While the goal at the death sent those at the match home happy, it still has to be concerning about the amount of points that are being dropped at home. With the amount of missed opportunities once again on display, this was very much a case of two points thrown away as opposed to one valiantly earned. One thing that can be taken as a positive from this game is that the Whitecaps are creating enough chances to capture all three points but they need to be more clinically finished if they want to be victorious. You can pin a number of things on Carl Robinson as the coach around tactics, team selection, and style of play, but he can’t put the chances away for these guys. They have to do that themselves and many of them tonight were laid on a silver platter for them. The Whitecaps will have another occasion to get the win in a few days time, with a quick turnaround for them when they host San Jose midweek at BC Place. This is very much three points for the taking. To do that they need to also take their chances more than they did tonight.